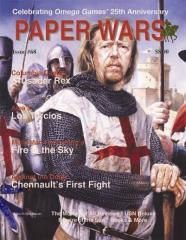 #68 "Crusader Rex, Fire in the Sky, Chennault's First Fight"
• Crusader Rex by Columbia Games written by John D. Burtt. • The Mother of All Reviews - Games on the Wars in Iraq written by Paul Rohrbaugh and Dave Boe. • Los Tercios 1490-1690 by Alea written by Kevin Donovan. • Empire of the Sun by GMT Games written by Brandon Einhorn with John D. Burtt. • Fire in the Sky by Multi-Man Publishing written by Doug Murphy. • USN Deluxe by Decision Games written by Kevin Reid. • Chennault's First Fight by Against the Odds written by Jerry Wong. • Warplan Dropshot II and III by Schutze Games written by Paul Glenn. • Crossfire Hurricane by Firefight Games written by Kevin Donovan. • Three Days of Gettysburg by GMT Games, LLC written by Walt O'Hara. • Turning Point by BSO Games written by Steve Carey.